I always knew triathletes were tough, but I didn’t realize how tough until I embarked upon a challenge that requires swimming. I’ll write more about that challenge another day (especially if I manage to complete it! ), but this post is just about the swimming. 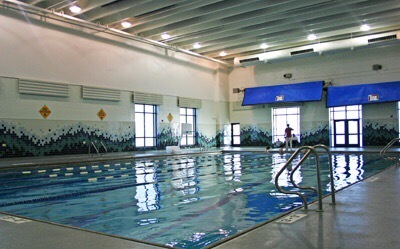 The first time I went to the pool (above, in the CSU-Pueblo Rec Center) to swim, I managed 10 lengths. Half of those were actually kicking with a kickboard (froggy-style), rather than a real swimming stroke. And I was exhausted. How, I thought, was I ever going to accumulate 169 lengths and complete the challenge? Fortunately, I at least knew how to swim. I read a post later that week about someone my age learning to swim for the first time and was grateful that my body immediately knew how to move and breathe when I got in the pool (thank goodness for all those swimming lessons I took as a kid). I tried again a few days later and managed 14 lengths, ten of which employed the crawl stroke. I still had to stop and breathe after every length. During this set, one of the pool employees took pity on me and brought me a pair of goggles to borrow. This helped, but I still felt like I was swimming uphill against the wind. Before the next session, I managed to obtain a pair of goggles and a new swimsuit (the old one was showing the same unattractive sheer spots that aged bike shorts tend to acquire). They did not make me faster. In fact, in this session I learned to go slower. I realized that I was swimming as fast as I could and getting winded with every length. So I decided to slow down and see if I could swim farther. Some progress was made. I completed 20 lengths. So, you may ask, why is this a new experience? Well, I have never been a swimmer. I did not participate in swim meets as a kid. I did not envy my high school classmates who met at the pool before 5 am for swim practice. I wanted the sky above me and the pavement below me, plenty of air to breathe and the feeling of propelling myself through air, not water. I was a runner, and a cyclist. Triathlons did not tempt me, because they required swimming. (Open-water swimming no less, but that’s a discussion for another day.) I learned to swim, because that was what one did and it was the price of being allowed to go to the city pool sans parents on hot summer days before air conditioning was ubiquitous. I’ve been snorkeling, but I prefer to stay close to the boat or shore and gladly accept the proffered personal flotation device. Swimming for exercise was a foreign concept until this month, and thus, a new experience. Stay tuned for news on the challenge. Will I continue swimming after it is over? I suspect not, but the experience has given me the confidence to consider training for the local “Ordinary Mortals” triathlon next year, since it requires just 12 lengths of the pool I’ve been using and does the swim last to avoid congestion.